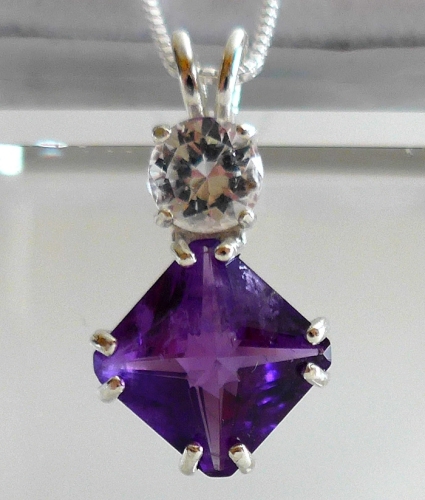 This beautiful deep violet Amethyst Mini Magician Stone crystal pendant is crowned with a large, round pink hued Danburite gemstone of exceptional quality, both in the style of the stone and in the simple silver band setting which allows the stone to breathe and function at its highest vibration. The combination of amethyst and danburite makes for a splendid Higher Worlds access and should increase ones ability to communicate through the spiritual heart. 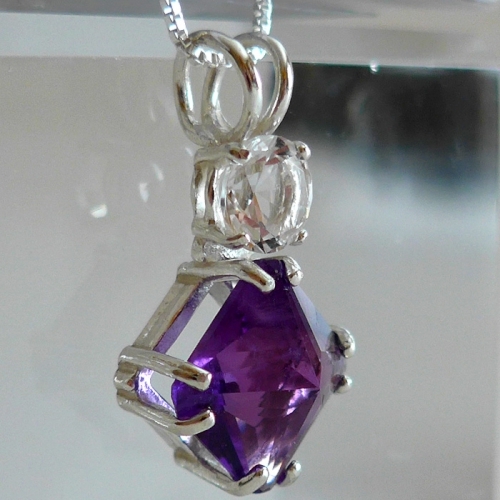 According to Melody’s fine book Love is in the Earth, amethyst “can be used to protect against psychic attacks; the energy of the attack being transmitted to the transmitted to the universe after its transformation into a positive, loving energy." Note: Weight above is shipping weight. Average actual weight is 4.8 grams. Each piece is unique made of natural stones and may vary slightly in appearance and dimensions. Each piece is guaranteed to be beautiful and to meet with your complete satisfaction!